I’m in your console, eating your commands! Facebook writes to the console a “stop” message, advising against using the console unless you know what you’re doing in an attempt to stop people making themselves victims of console-based social engineering attacks. Using CSS directives like background, then, it’s easy to see how one could embed an image into the console, and that’s been done before. Instead, though, I wanted to use the lessons I’d learned developing PicInHTML 8¾ years ago to use text and CSS (only) to render a colour picture to the console. 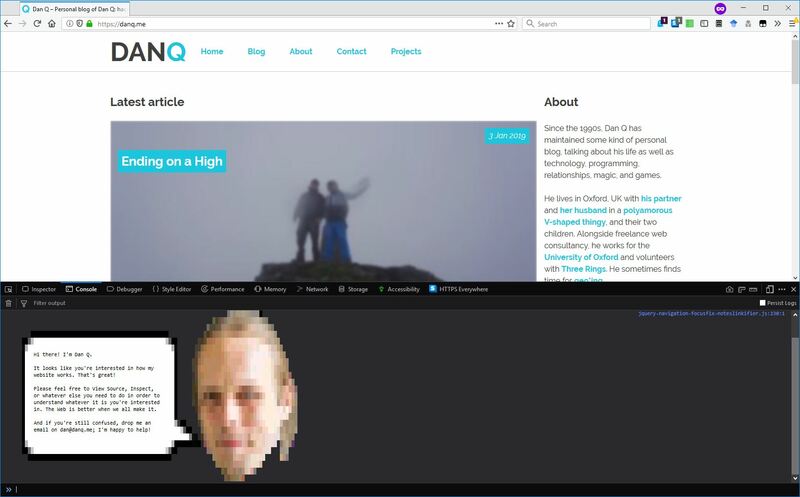 First, I created my template image – a hackergotchi of me and an accompanying speech bubble, shrunk to a tiny size and posterised to reduce the number of colours used and saved as a PNG. The image appears “squashed” to compensate for console monospace letters not being “square”. I’ll be first to admit it’s not as cool as the “pop-up Dan” in the corner of my 2012 design. You might enjoy my blog post about my 20 years of blogging or the one about how “pop-up Dan” worked. You can’t expose your own eggs! Dan investigates the pioneering Progressive Web App features of Edge Dev.